A gigantic prehistoric shark called the Megalodon (or Meg for short) turns out not to be as extinct as was thought, and terrorises a research expedition, who are forced to call in a hard-man rescue-diver to save the day. No, it’s not the plot of a SyFy channel movie, or a Shark Week spin-off. It is instead this Summer’s aquatic creature-feature. The Meg sees Statham make use of his championship swimming and diving background (it’s a thing – look it up) playing the aforementioned rescue-diver. As is the norm in these films, he has hung up his rescue gear following a trauma from a previous job that went wrong, but is coaxed out of retirement for this job. Realising that, despite the scientific magnitude of the discovery, the Meg must be destroyed, the crew very wisely take to the open seas – or as the sharks call it the canteen – to attempt to take out the 75-foot carnivore. But let’s face it, if something that you thought was extinct for 2 million years is still alive, it’s probably going to prove a formidable foe. Not as formidable as Statham obviously, who jumps into the sea to shoot it with a GPS tracker. As you do. I mean swimming with sharks – especially gigantic prehistoric ones – is a hoot. And clearly nearly becoming sushi for the shark once isn’t enough for him, as he gets up close and personal with the beastie on several more occasions, before we reach the conclusion. If that all sounds a bit silly, it’s because it is. In fact, it’s borderline ludicrous at times, and has one of the cheesiest scripts committed to screen so far this year. In fact, if it wasn’t for the presence of Statham et al, it would probably indeed have been a SyFy special. But that doesn’t matter, because it’s actually great fun. I found myself enjoying The Meg in spite of myself. There is a lot of humour in the script, alongside the cringe-worthy moments (and there are plenty). The effects aren’t ground-breaking, but they do work, and this does what it says on the tin. It’s the modern equivalent of the 1950s B-movies. The Meg doesn’t want awards or plaudits, it just wants to help the audience escape for a few hours. I can’t really break this down critically, because it’s not that kind of movie. But it’s also not what you’d expect. The Meg is quite the romp, and has plenty of moments that will make you gasp, even though you will probably see them coming. 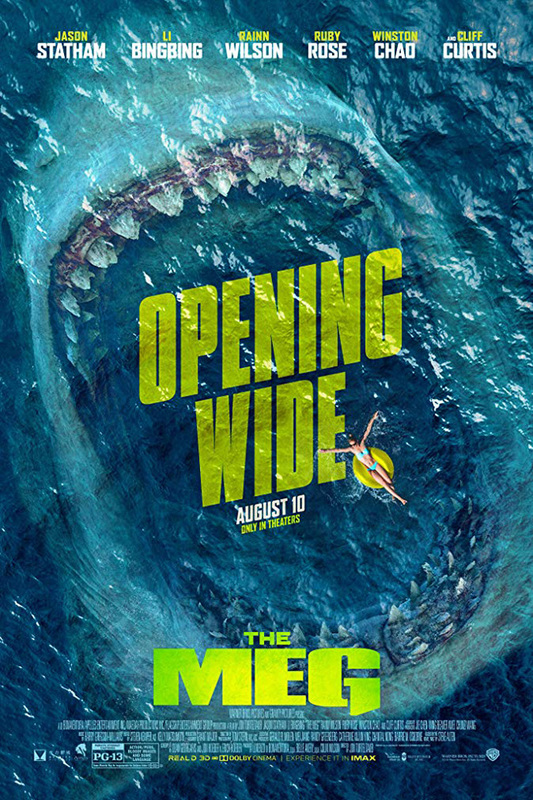 The Meg definitely isn’t Jaws, but if you like your sea-creature on the more prehistoric side, and your action-heroes on the rough and ready side, then you’ll enjoy this. I can’t see it spawning any sequels, but it should entertain most cinema-goers. A word of advice though – try and see The Meg in 3D to get the full benefit of some of the shark scenes.